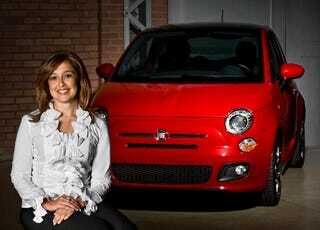 Was Fiat's Laura Soave fired because of an "improper relationship"? Bloomberg reported moments ago that Chrysler's head of the Fiat brand in North America, Laura Soave, is "leaving the company" and being replaced by Tim Kuniskis, a marketing executive. But why? I've heard unsubstantiated rumors for a couple months now from sources knowledgeable of internal Chrysler politics that she was being investigated for a possible improper relationship with Michael D'Antonio, the CEO of former Fiat ad agency Impatto Custom Marketing. Of course, it also might have to do with North America sales of the Fiat 500 through October hitting just 21,380, well short of Sergio Marchionne's forecast of 50,000 in sales for the year. But many might argue that that rollout was held back by Chrysler's decision to create new stores for Fiat instead of using space within Chrysler dealerships. Who knows if that was her call or Marchionne's? Maybe she's merely the scapegoat. Anyone know anything more? Send me an email by clicking on my email in the drop-down on my name at the top of this post.